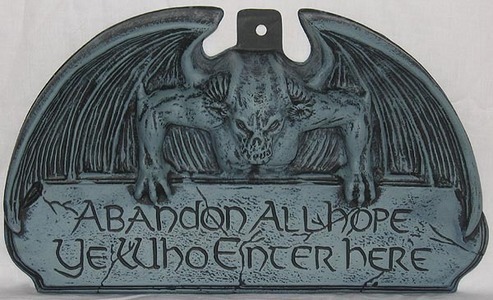 Actually, that's the sign on the exit door from Modtopia, for when we leave to enter the rest of the forums. Yeah. It's right next to the cabinet with the assault rifles and kevlar vests. We need to change our tactics. Congratulations guys, thanks to you all and to the existing moderators for the time you invest in this forum we all enjoy. Ooh, good choices all! Nice one! Congratulations to our newest team additions. I was hoping for Robert Byers, Atheistoclast or Lion IRC, but never mind! Congrats/ condolences to the fab five! Excellent! More bastards to despise! devogue wrote: Excellent! More bastards to despise! Yeah, mods should not be likeable, it spoils all the fun. Well done new mods - thanks for supporting the forum with your time. So we have a new batch of runners in the stable and the question is who will be the first to raise a mod note this season. AlohaChris - Bit of a dark house from the American stables. Should find this going to his liking and could well push his nose to the front quickly. Early betting is picking up at 4 to 1.
matt8819 - A novice on this track but has made an impressive start and is well fancied by many punters. Expected to make an early show and steps in as second favourite at 2 to 1. Nautilidae - This gelding has little form so far but is well fancied. Would make a good each way bet at 6's. Will watch his first outing with interest. THWOTH - An elegant stallion and best suited to a longer course and much prefers heavy going but expected to stay the course. Will take some time to show here so betting is at 8 to 1, could go out a point or two as the younger studs find their legs. The_Metatron - Makes a welcome return this season after a lay off due to too much hay last season. Knows the course well so must be the bookies favourite at even money. John, one has already given a warning and suspended a member for a week. First results are now in and a surprise showing from Nautilidae after making an outstanding start from the stalls and continuing to lead from the front, leaving the rest others runners for dead. Winner by 5 lengths - Starting price 7 to 1 and punters in the know should clear up. However we fully expect an objection to this result so no payouts will be made for 1 week. z8000783 wrote: So we have a new batch of runners in the stable and the question is who will be the first to raise a mod note this season. Welcome to the blue noobs! They're all extremely likeable, unlike us old buggers. I demand a stewards' enquiry.